Green Concealers are a brilliant invention, they cancel out redness which allows you to conceal problem areas with out caking or layering traditional concealer. 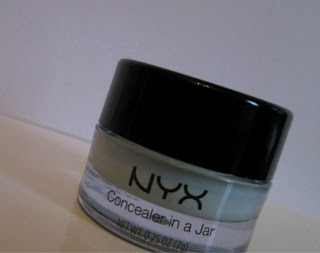 As I have rosy cheeks that sometimes, with cold weather, can become a more irritated version of rosy and a fair amount of Hyper pigmentation to deal with I thought I'd move to the green side and try the NYX Concealer Jar. As I'm a fan of NYX products I had high hopes for this product but unfortunately it wasn't for me. 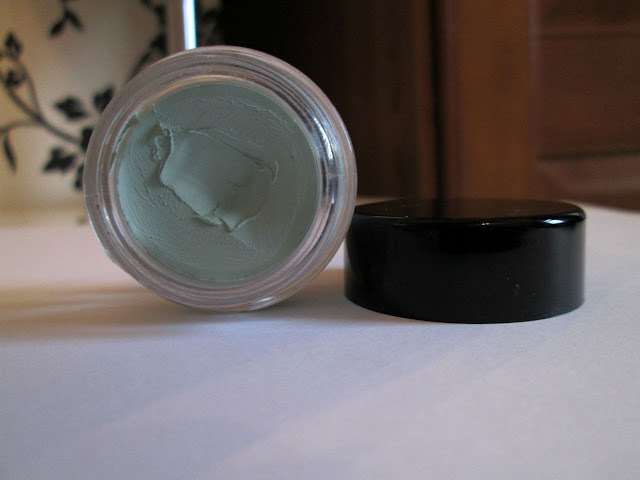 NYX Green Concealer is a soft, thick concealer that lives in a small plastic jar. The texture is creamy and applies with ease regardless of if you're covering a small or larger area. Unfortunately, this concealer doesn't conceal as well as it applies and only gets worse when you attempt to blend it. When applied this concealer isn't fond of doing much else apart from sitting on your skin. I first tried to cancel out the redness from Hyper pigmentation scarring around my chin area as that is what bothers me most. I applied tiny amounts only on the area that was effected and stippled this in to my skin. After stippling, the concealer seemed to lose the green colour and blend to nothing but an odd off green/white shade. I then repeated the process a few times but still had the same result. As this didn't work I changed tactics and blended the concealer on to my cheeks as well as my chin, this resulted in making it look worse than before. The concealer leaves a powdery white/off green finish which in no way covers any redness, in fact, I'd say it highlights what you're trying to cover. Fast forward a few months and I decided to give this concealer a last try and decided to try mixing it with my normal concealer/foundation, this had the same effect but just gave it a less matte finish. After trying different methods to make this concealer "work" I can safely say this is not a great product. As much as I love NYX products this concealer gets a massive thumbs down from me. I've read great reviews on this product so the only thing I can put it down to is it's not great on oily skin. I think in future I'll stick to a high coverage concealer instead of layering a medium coverage product or searching for a reliable green concealer.